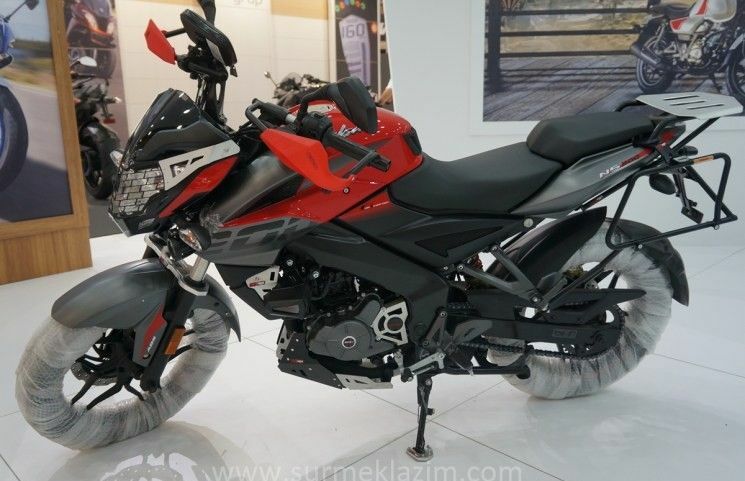 Bajaj Auto has showcased an adventure version of its Pulsar NS 200 motorcycle at the ongoing Motobike Istanbul trade show in Turkey. The showcased bike mainly carries cosmetic upgrades in the form of guards and mounts for touring bags. Bajaj might consider bringing this variant to India or, at least, get the accessories here. Turkey has been an important export hub for Bajaj and it was at one of the motor shows there that we first got a glimpse of the Pulsar NS 160. And now, Bajaj has showcased the adventure version of the NS 200 there, which gets a lot of touring add-ons like mesh headlamp cover, knuckle guards and engine guard. It also gets a fork brace for added rigidity, though the forks themselves do not seem to get longer travel, despite its adventure aspirations. The headlamp gets what appears to be mounts for a large flyscreen. It also gets a phone case on the right handlebar, which should be helpful for navigation. The tail section gets a new number plate mount along with a rear luggage rack and mounts for saddlebags. The NS 200 is a good bike for touring; it has a more upright riding position and the seat too allows you to ride for 100km, at a stretch, without worry. The suspension, despite being set up on the stiffer side, is pliant and handles most road imperfections with aplomb. Its 200cc liquid-cooled and carburetted single-cylinder motor makes 23.5PS of power at 9,500rpm and 18.3Nm of torque at 8,000rpm. Bajaj does sell a fuel-injected variant overseas, but we get the carburetted version which retails at Rs 97,715 (ex-showroom Delhi). Also, Bajaj recently introduced an ABS version of the NS 200 for Rs 1,09,715 (ex-showroom Delhi). The NS 200 competes with the TVS Apache RTR 200 and the upcoming Hero Xtreme 200R in India. If Bajaj plans to launch the adventure variant here, they might price it Rs 5-6 thousand over the existing bike. The Bajaj pavilion at the trade show also had a stock NS 200 with a new grey/yellow paint scheme which might make it to India in the coming months.